The Atos team in control of the complex IT environment supporting the London 2012 Olympic Games is about to recreate the live environment for a week in the final dress rehearsal before systems go live. This is one of the final hurdles at the end of a journey that began in 2005, when Atos was appointed integrator for the London Olympics 2012. With the start date in the diary, Atos knew delays were not an option. “We had seven years' notice to the exact second,” said Patrick Adiba, CEO at Atos’ Olympics operation. On July 27 the London 2012 Olympic Games will begin and, behind the scenes, over 3,500 IT professionals will be working 24:7 to ensure it runs smoothly. As the official Olympic Games integrator, Atos will co-ordinate an ecosystem of suppliers (see panel, below right) as well as thousands of IT workers. Every last detail, from the correct recording of the 100m race times to access privileges to all people involved in the games, requires the interaction of people, processes and IT systems. Next week's test will be the second live rehearsal, which will see five days of testing in preparation for systems to go live on July 13 – two weeks before the London Olympics 2012 begin. In April, at the first live rehearsal, over 300 IT professionals operated in simulated Olympic Games conditions to complete the tests. The first test was more focused on people and processes, whereas the second test will push the IT to the limit. During the five day rehearsal, Atos will simulate the Olympic Games by using the data collected at the Beijing Olympics four years ago. The information processed on the busiest three days in Beijing will be fed into systems to ensure everything is ready for the real thing. 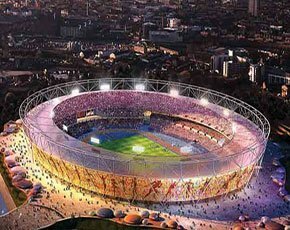 The London 2012 Olympic Games is expected to process 30% more information than at the Beijing games. The Technology Operations Centre (TOC), based in Canary Wharf and duplicated in a secret location, is the nerve centre (see panel, below left). This is where problems are identified through monitoring and decisions are made on actions to take. It also acts as the communications hub between the numerous IT teams. The Beijing Olympics saw an average of 16 million events on systems, where potential problems arose every day. These can range from security events to simple logging-in errors by volunteers. Each events is given one of four levels of priority. Atos’ Michele Hyron, chief integrator at the London Olympics, said the TOC operates at the heart of operations, which can’t miss a beat. “If the worker in the next shift does not arrive, you do not leave your desk,” is the message to TOC staff. Software applications used at the Olympics fall into two groups. The first includes results information systems and core games management systems, such as a workforce management and scheduling application; the second is a system to accredit participants, workers and volunteers. The interdependencies of systems are vast and the smallest failure risks massive disruption, for example if a world record was incorrectly timed because of a system failure; or if a judge was denied access to a venue because a smartcard was not recognised. There will be 900 servers, 1,000 network and security devices and more than 10,000 computers deployed to support London 2012. There will have been over 200,000 hours of testing of systems before the first athlete begins their pursuit of gold. London Olympics 2012 will be the first tournament to have a Commentator Information System (CIS) that provides information in real time to a commentator at any place in the world. Messages sent on the remote CIS will take 300ms to go from event to commentator. She said the live rehearsals usually reveal ways of improving processes. In contrast, the technology in use has been set in stone for 18 months. What next for Atos games technology? Although Hyron unsurprisingly refuses to talk about it, Atos will soon be focusing its attention on the Rio de Janeiro 2016 Olympic Games. But before that, Atos must complete preparations for the Commonwealth Games in Glasgow in 2014, as well as the Winter Olympics in Russia the same year. But even before this, the London Paralympic Games – which immediately follow the London 2012 Olympic Games – needs IT. Following the Olympic Games, the IT team will decommission systems and re-install them for the Paralympics. The London Paralympics is about the size of a Winter Olympics, in the number of athletes and events. When the games end there will be a legacy left to UK sport with hopes that the biggest event in the world will encourage children to aspire to becoming future Olympians.